When it comes to laying patio that you can enjoy every day or a putting down a driveway that will transform the entrance to your home, there are many different patterns from which to choose from. It’s not a difficult job if you are a DIY enthusiast simply put aside some time at the weekend, however, we do advise that you employ a professional to do the job to ensure that it looks right and installed properly. Soon you will be entertaining family and friends in your back garden or make the entrance to your home inviting and functional. This guide can be used for all paving slabs including sandstone, crazy paving and granite paving. The details below are not an exhaustive list of the do’s and don’ts in laying paving but they are a good start. We recommend that whenever laying Natural Stone you should mix your paving from 3-4 different packs/crates (where possible). 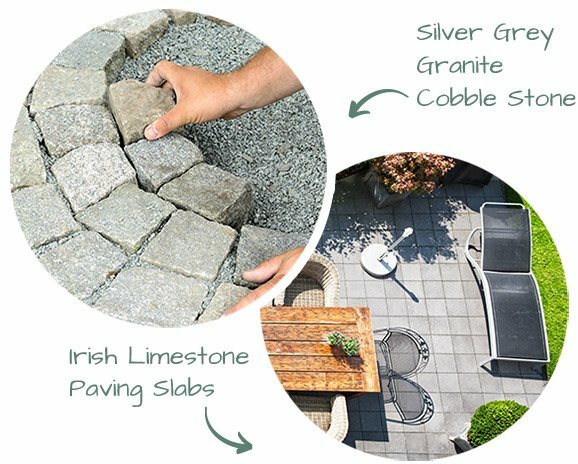 Proper stone selection will allow the colours to blend and help to improve any shade variations that may occur between packs, giving your patio a more natural look. It is recommended to use a slightly wet mortar mix – 1 part cement: 5 parts building sand. 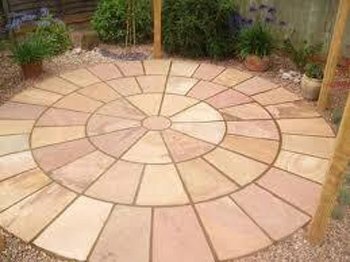 Some paving slabs can vary in thickness and as such the following five spot method is recommended. Starting from a corner or straight edge, trowel five large dabs of mortar at each corner and in the middle of each slab’s intended position, placed slightly higher than the finished level of paving. Once you have laid the first slab, lay the 5 spots of mortar for the next slab. You could also lay a strip of mortar where the next joint will be, this will help minimise pointing afterward. A paving joint of minimum 10-15mm is recommended. If you need to cut a lot of slabs it is advisable to hire a powered cutting tool with a diamond tipped blade. Any hire shop will advise you of the relevant machine and blade you will need. Take relevant safety precautions and ask your hire shop for the tool instructions and relevant safety equipment. 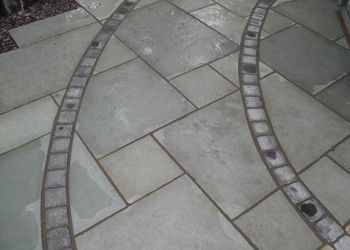 There are several methods and products on the market to help with the pointing of paving products. We highly recommend the use of ROMPOX jointing mortar. A mix of sharp sand and cement (3:1) is also often used. The joints should be pointed as soon as possible, except where adverse weather conditions are forecasted. We recommend you clean your paving at least every 6 months. Avoid using power washers as it will lift the jointing. We do recommend the use of sealants as they are suited to the extremes of weather we experience in Ireland. We have a range of cleaners for various patio stains including algae, oil and general wear and tear.